Kinshasa (Agenzia Fides) - The diocesan phase of the beatification cause of His Exc. Mgr. Christophe Munzihirwa Mwene Ngabo, Archbishop of Bukavu, assassinated in 1996, has concluded. The announcement was made during a press conference held on 29 October in Bukavu, the capital of South Kivu in the east of the Democratic Republic of Congo. "The Archdiocese of Bukavu gives thanks to God for the work carried out to conclude the "diocesan phase" of the cause of his beatification. The fruit of this demanding effort will be sent in a sealed envelope to Rome and we will continue to pray so that the Roman phase will end with the proclamation of Blessed on behalf of the Church", says a statement from the Archdiocese of Bukavu. The Servant of God Mgr. Munzihirwa was born in 1926 in Lukumbo in the eastern part of the DRC and was elevated to the episcopal dignity as coadjutor Bishop of the diocese of Kasongo, on March 10, 1986. On September 15, 1993 he was appointed Apostolic Administrator of the Archdiocese of Bukavu, while remaining Bishop of Kasongo. In April-May 1994, he participated in Rome in the Special Synod for Africa. On his return, he took possession of the Archdiocese of Bukavu on June 26, 1994. Mgr. Munzihirhwa was known for his frankness, courage and strength in denouncing the evil, injustice and illegal occupation of Congolese territory by foreign armed groups who committed crimes and violence against the local population. 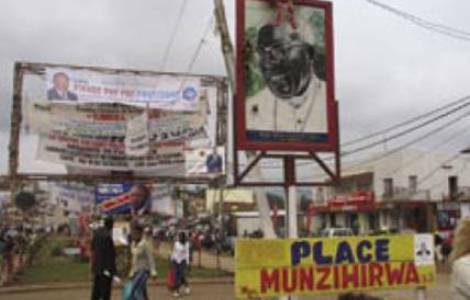 On 29 October 1996, Bukavu was captured by the forces of the AFDL (Alliance of Democratic Forces for the Liberation of Congo) of Laurent Kabila. In taking the city, the rebels killed Mgr. Munzihirwa. The Archbishop died in a situation of total poverty. The streets were deserted, the people were holed up in their homes and corpses lay in the streets of the city.